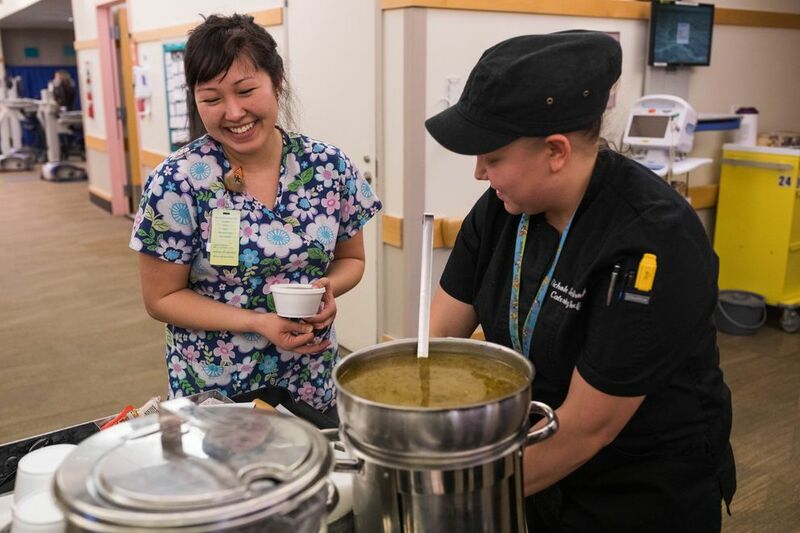 The soup, which has been served on Tuesdays at the hospital for about a year, is made from harbor seal bones and meat. 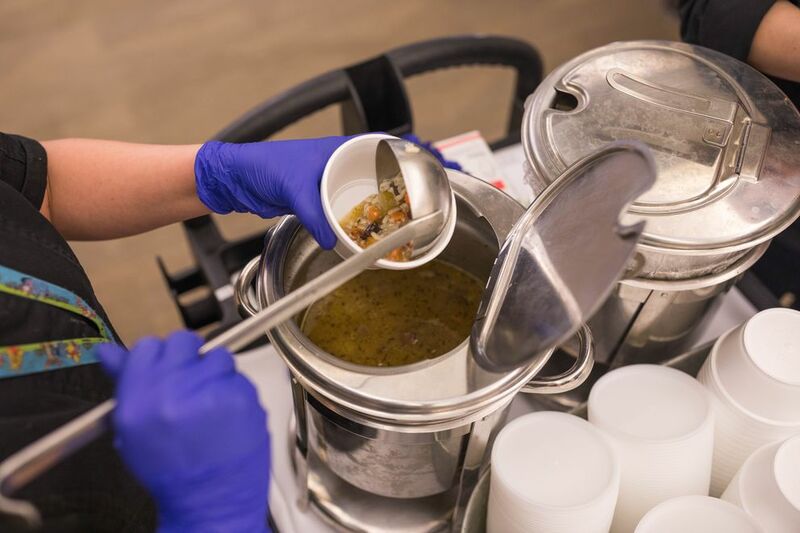 Changes in federal food rules in 2014 allowed the hospital to begin serving donated subsistence foods. Now the hospital’s menus regularly feature caribou, seaweed, wild berries, moose, white fish and herring eggs. But seal soup, prepared in a simple, generations-old style, is the only dish featuring marine mammal. 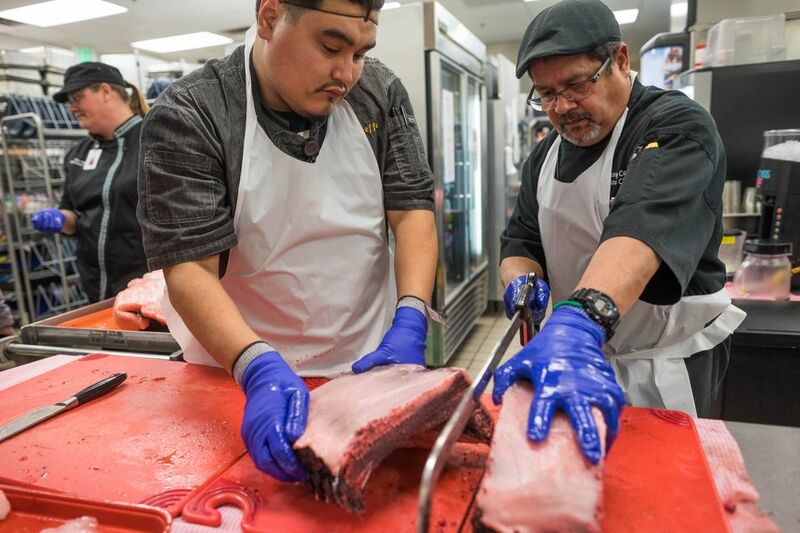 It is likely the only food service preparation of marine mammal in America. Servers say elders, many who are away from their villages for medical treatment, frequently become emotional when they eat it. Hull, 76, lives in Anchorage but is originally from Bethel, she said. When she sipped the broth, she smiled and asked for “hard tack,” or pilot bread. Seal, walrus and whale are important proteins in many traditional Alaska Native diets. Nutrient-rich seal oil is rendered from the cold-water animal’s fat, which liquefies at room temperature. The golden, marine-scented oil is eaten throughout the state by coastal Alaska Native groups and is widely believed to have healing properties. 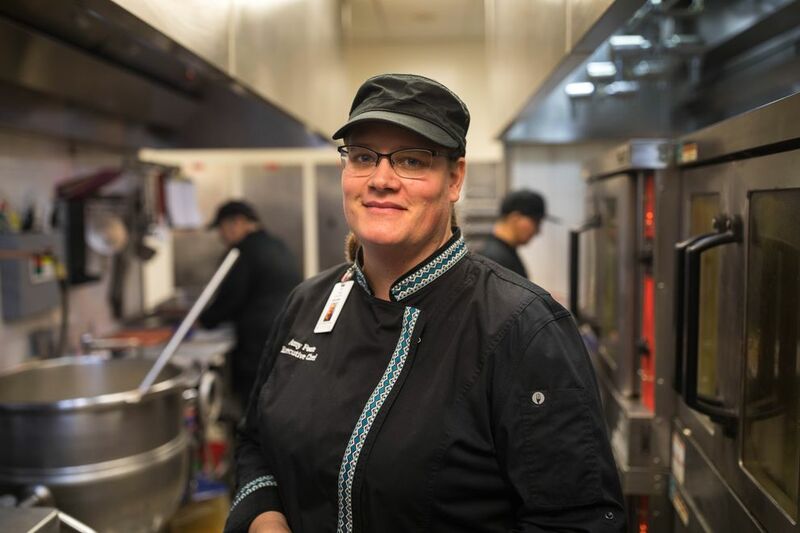 Amy Foote, the hospital’s executive chef, makes 100 to 175 servings of the soup a week. It always runs out, she said. Foote, who is not Alaska Native, has learned subsistence food preparations from Alaska Native cooks and then adapted them to fit with the most common dietary restrictions patients have, she said. Native recipes are often unwritten and must be developed through trial and error and then scaled up. Seal soup, like fry bread, has many regional variations. “Everybody makes it a little bit different,” she said. The hospital soup is made by simmering a rich stock with bones and fat. Then Foote adds vegetables and meat. Some cooks make seal soup with potatoes or macaroni as the starch. Foote uses rice. Some cooks also prefer a broth darkened with seal blood, which lends the soup nutrition and follows the subsistence value of using all the parts of an animal. The hospital makes a lighter version without blood, meant to appeal to the widest number of palates, Foote said. The soup is similar to simple chicken soup, but slightly oilier, with a light marine flavor. Donated proteins like caribou and moose can be sent out to be processed elsewhere, but seal must be processed in the hospital kitchen. There is no commercial seal meat processor, Foote said. She has a lot of experience with wild game, but seal is different. Foote said the hospital would consider serving whale or bearded seal if enough was donated. Walrus, along with polar bear, bear and fox, is prohibited because of the trichinosis risk, she said. Harbor seals weigh more than 100 pounds (they can range up to three times that size) and are covered in a thick layer of blubber, which turns to oil in the warmth of the kitchen. Usually a strong kitchen worker must brace the partially frozen meat while another cuts with a bone saw. Right now, much of the hospital’s seal comes from outside Haines, where Tim Ackerman, who is Tlingit, hunts them the way his elders did, canoeing to the rocky shores of Chilkat and Chilkoot inlets and calling the animals in. The seal in his area are more plentiful than they have been in a long time, and they deplete the salmon that other animals depend on, he said. After he dispatches them, he paddles them in, skins them and butchers them into quarters. He provides meat for elders in community, but the demand isn’t high. The younger generation doesn’t have the same taste for it, he said. “There’s probably about a dozen people or so, they’re old-timers, they make their request to me. We just harvest and deliver,” he said. Ackerman keeps some for himself. He prefers seal ribs and jerky. What remains is donated. Subsistence foods cannot be sold. The hospital provides shipping materials and pays to have the meat sent to Anchorage. The seals are protected by the Marine Mammal Protection Act of 1972 but may be hunted by Alaska Natives for subsistence purposes. Up until the passage of the act, seals were widely taken for fur and the state paid bounties for them in an effort to reduce their population and stop them from competing with fishermen for salmon, said Peter Boveng, Polar Ecosystems Program Leader with the Alaska Science Center in Seattle. There are more than 200,000 harbor seals living along the Alaska coast, ranging from the bottom of the panhandle north to Bristol Bay, according to a 2017 report from NOAA. The size of the subsistence take, last estimated between 2004 and 2008, was around 2,000 animals, according to NOAA. Though there have been population declines in other regions, the harbor seal numbers in Southeast Alaska, where most of the hospital seal comes from, are “robust,” Boveng said. Foote said she’s been moved many times by the way the first mouthful of soup stirs up memories for older patients. “I had a gentleman, we offered it to him,” she said. “He took a couple bites and he looked up at me and started tell me stories of hunting with his family and cooking shore lunch. Here he is, in the hospital, sharing his memories of cultural time and love." Because so many people come from elsewhere to receive care at ANMC, the hospital has a strong visiting culture. It’s a place where young urban Alaska Natives spend time with older relatives from villages. 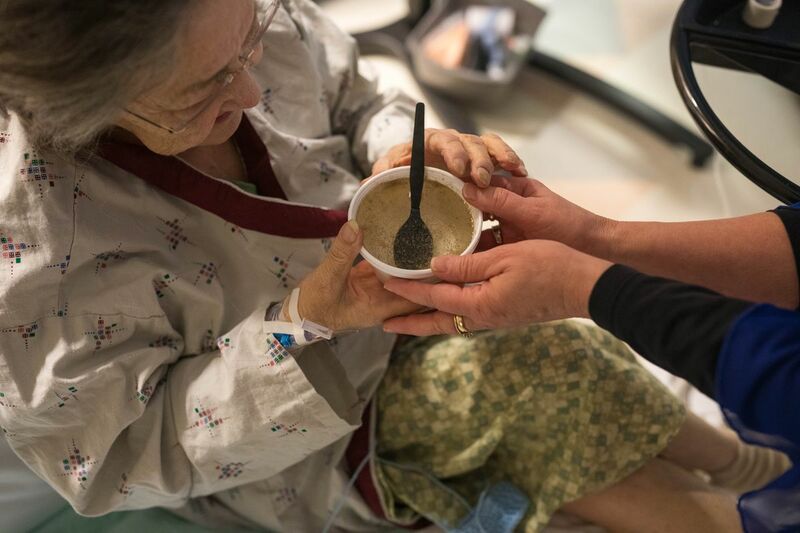 When the hospital serves traditional foods, elder patients encourage younger relatives to try it, Foote said. “Getting the taste” for subsistence foods is a way to hang on to culture for Alaska Natives who live outside of rural places where the food is abundant, she said. Foote recalled a recent scene where a teenager and his friend, visiting an older relative, relented to the relative’s request that they try a spoonful of soup. Method: Trim meat and fat from bones and cut the meat into cubes. Boil the bones in water for at least 50 minutes, reducing liquid by half. Strain and set stock aside. Over medium heat, sauté meat and vegetables. Season to taste with salt and pepper. Add stock and rice. Simmer for 30 minutes and remove from heat. Add greens and cover to allow them to wilt. Serve immediately with pilot bread.